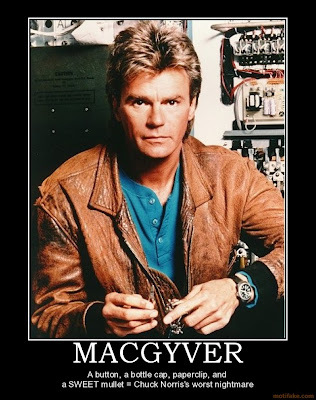 A recent experience made me think of the acclaimed show Macgyver and the countless predicaments the eponymous hero finds himself in. 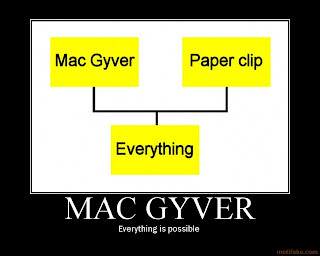 Against all odds (♫ How can I just let you walk away...just let you leave without a trace...♫), Macgyver finds a way to use ordinary items in extraordinary ways to extricate himself from great peril and often an assured, gruesome demise. I had such a moment a few weeks back that provided me with the exhilarating thrill that can come with only a fleeting, magical moment of ingenuity. I was on my way to the shower when Heather said, "Umm...can you come look at this? I think we have a problem." I was able to decipher the unspoken part of her message simply by looking at her face. The quiver in her brow said, "...and by 'we' I mean me because I just did something that I think you're going to be upset about." Standing in the buff in the kitchen (I know, I know...too much information. What can I say? She nabbed me literally on my way into the shower. 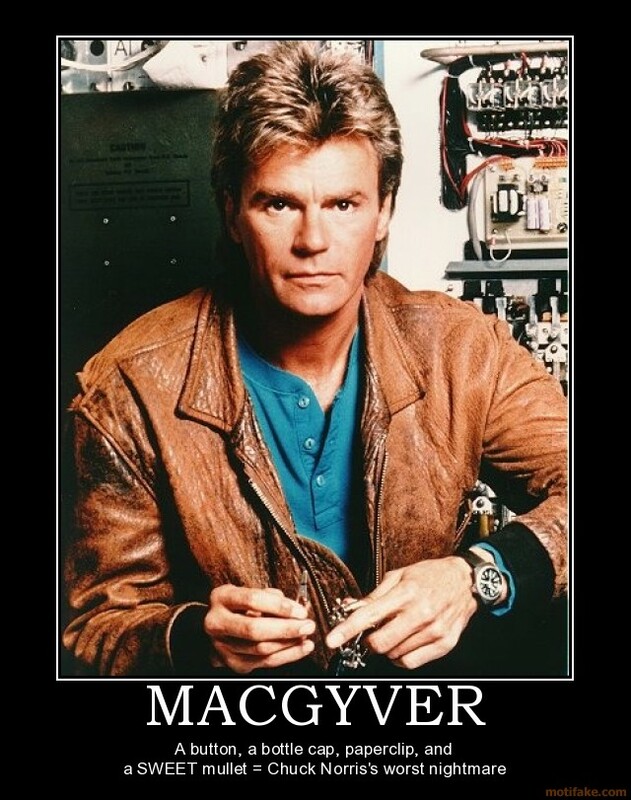 If the sight of my bare-bottom revulses thee, then picture Richard Dean Anderson then, if it please ye!) I'm staring at a sink nearly overflowing with...a liquid substance. Water is undeniably a constituent component of said liquid body but, as it laps against the edges of the sink, I notice that there is a peculiar thickness to it. It is almost like the sink is filled with gelatin but it is not quite that heavy of a liquid. It is something I have never seen before...an alien fluid lapping at the steel shores of my kitchen sink. Taking a deep breath, I approached the sink and looked in; it reminded me of an episode of Fringe in which a pathogen was released that essentially encased the innocent commuters on a bus in an amber-like substance. As I am surveying the scene in the sink I notice that there are a variety of items floating atop and suspended in the strange semi-solid sea of liquid. One of these is an innocuous grey piece of plastic. All at once, I understand what has happened, much like on a serialized television crime program; I am Colombo incarnate at that moment. "I think I know what happened," I said as I plunged my hand into the viscous body in my sink; it was slightly warm and it made me think of what is removed during a liposuction treatment. As it turns out, this is not that far from the truth. I fished around by the drain, hoping to find some sort of obstruction causing the clog; I come up empty handed. As I remove my hand I notice that it is glistening with the same sheen of the mystery-substance in the sink. I take a deep breath and ask Heather the question that I believe is at the heart of the issue. "Did you clean off the Foreman grill drippings collector thingy before you put it in the sink?" As Heather launched into an explanation and justification of her action, I simply shook my head and laughed. I had made some amazing burgers the night before, using two thin patties for each one. After seasoning one side of both patties, I placed torn bits of cooked bacon and shredded cheddar cheese atop the bottom one before sealing the decadent payload beneath the second patty. After sealing the edges of the combined patties, I placed them on the Foreman grill to cook. The result was both an immensely flavorful burger and a prodigious amount of liquefied fat. There was so much lipid byproduct that it actually overflowed onto the counter. We were both beyond sated at the conclusion of the meal and, with Heather offering to do the dishes, I thought nothing of it and headed upstairs. She decided to leave the fat in the drip collector, allowing it to congeal into a solid mass. This was fine and, had she simply scooped it out later on and dumped it into the garbage can, all would have been well. Unfortunately, she did not. "Don't tell me you just put the whole thing into the sink when you were washing the dishes?" I asked. "Well...yeah! I didn't think it would be a problem! The fat was solid." "Dude, that hot water turned it back into a liquid. We have a sink full of fat right now." She looked mortified and sad. Then, she turned her eyes towards me with the look that, deep down, any man would fear in such a situation: expectation that I was going to take care of this somehow. I thought about using a plunger but, I'll be honest, the thought of using something that has swam in the toilet with unspeakable flotsam in our kitchen sink made me gag a little bit. Suddenly, the Richard Dean Anderson light bulb goes off above my head. "I have an idea," I say, as I begin pacing back and forth in the kitchen. Heather remains silent as I mull over what seems to me like both a dangerous and exotic solution to the problem. The procedure is simple; the result is potentially catastrophic. I decide to go for it. I am thinking of utilizing a technique my Mom gave me for clearing clogged drains, either in the sink or in the bathtub. I have used this method before to great success. I realize though that I have not used it before with a sink brimming with lardaceous liquid. Or in the buff. The method calls for filling the afflicted drain with a sufficient quantity of baking soda and then pouring vinegar on it. The resulting chemical reaction has been used countless times by grade school children in their science projects: the famous volcano effect. The energy created by the reaction produces a bubbling that acts much like Drano or other drain cleaners, effectively forcing the percolating mixture down into the drain, thereby removing the clog. The problem with our predicament though was that there was a good eight to ten inches of liquid between me and the drain. This is where the Macgyver thinking came into play. "Heathe--do we have any of those baby bottles left over from the Baby Shower?" "Okay, grab me one of Timmy's bottles." She does. I am not sure that I do, though. I belie self-confidence with a rapid wave of my hand, as if saying, "Come, come--we don't have all day!" The logic behind my idea, at least to me, is simple and sound: if I place the baking soda into the bottle, pour in the vinegar, turn the bottle upside down, and slam it down against the drain, I should, in theory, produce a situation that would force the mixture down into the drain. I was thinking of what happens when you force a cup into a basin of water. If you do it hard enough and quickly enough, you'll procure a small pocket of air at the top of the upturned bottle, much like when a boat capsizes. My logic says that the baking soda should, in theory, react with the vinegar and, because of the resistance provided by the air pocket in the bottle, a certain amount of suction should be created--a downdraft, if you will, that will force the bubbling liquid down into the drain and, in theory, dislodge whatever might be clogging everything up. Of course, it is equally likely that nothing will happen with the mixture at all and it will simply coagulate and assimilate into the sebaceous entity now occupying my sink. A third, less likely but equally possible outcome could be some unforeseen explosion of fattiness all over the kitchen. And me. I consider obtaining a towel for myself but by now it is too late--I'm too far in; I've surpassed the event horizon. It's do or die baby and I'm going for it! As I stare down into the sink and line up my shot, I realize that the diameter and circumference of the bottle's opening is nearly identical to that of the drain at its lowest point. Basically, I need to be completely accurate when I slam the bottle down through the fat, otherwise I risk losing the mixture entirely. This would obfuscate the liquid in the sink and the resulting cloudiness would render a second attempt futile; it would have to be a perfect shot. Breathing deeply to calm my nerves, I summoned the concentration of some of history's greatest shots, invoking the steadiness, self-assuredness, and accuracy of William Tell, Robin of Loxley, and Roland Deschain, with a little Penn and/or Teller thrown in for good measure. I looked down at the sink and heard a thousand doubts coursing through my mind simultaneously. Shaking my head, I poured the baking soda into the bottle, wondering how much would be enough. After filling it up roughly a quarter of the way, I grabbed the bottle of vinegar. Without so much as a moment's hesitation, I poured in a few ounces of the distilled liquid, lifted the baby bottle into the air, and slammed it down into the drain. Time slowed to a crawl. I wondered for a moment if everything was going to move in reverse and if I would see my arm moving in an upward arc, returning back to its original position. Everything stopped, as if Heather and I were, ourselves, immersed and trapped in the fatty, liquid prison in our sink, living in a giant, reversed microcosm of the tableau we stood before. I held the bottle down against the drain, feeling the warmth of the fat against my arm. I stood with bated breath, awaiting something, anything, to happen. I heard and felt the reaction occurring in the bottle and wondered if it was going to go the way I hoped it would. I heard a strange sucking sound coming from deep within the drain. For a moment, I wondered if my crazy idea was actually going to work. I find myself standing naked in front of a fat-filled sink, holding an empty, upturned baby bottle volcano. "How did I get here?" I wonder to no one in particular. "I was just going in to take a shower. Is this where my life has taken me? Is this what I have been reduced to? An overweight, naked man, standing before my fatty failure?" a second sound of suction emanated from the sink. This one, though, was much louder and forceful; it was not merely the sucking sound heard previously but was instead the resounding roar of success, of ingenuity vindicated and my existence as a man affirmed; in a word, it was: beautiful. Within a few seconds, the entire sink was emptied. I watched with unbridled glee as the last bit of liquid swirled down through the drain. I took note of the individual items now resting on the steel surface of the sink and found myself drawn to their disturbingly brilliant sheen. I knew that Heather wouldn't mind taking one for the team and cleaning everything. After all--it was her doing the dishes that started off the entire debacle! I turned and grinned, handing her the baby bottle. "Well, glad that's taken care of," I said with a coy smile. Heather's gaping mouth confirmed the awesomeness of what had just happened and filled me with unexpected pride, as, for one of the few, rare occasions in my life, I found that I was the source of such awesomeness. "How the hell did you think to do that?" she asked, shaking her head. "I don't know, but I really need a shower."